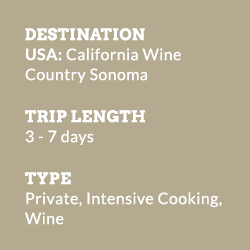 Cradled between two mountain ranges, Sonoma and Napa Valley is a stunning vacation destination, the birthplace of world-famous California wines, and home to acclaimed organic farms, artisan foods, and legendary chefs. Rolling hills and vineyard-laced farmland make it perfect for culinary adventures and relaxation. We invite you to cook in our wine country kitchens, indulge at the spa and enjoy the bounty of this region. If you like to join a small group of like-minded travelers for cooking classes and also cherish your privacy. All tours outside of cooking classes are private with your own guide. 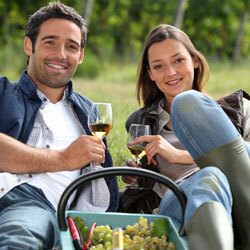 It is the best of both worlds – convivial classes and travelling at your own pace! Sonoma County is one of the most breathtaking wine growing regions in the world. With over 60,000 acres of vineyards, 400 wineries and a multitude of award winning restaurants combined with stunning scenery and intimate resorts, it provides the perfect culinary getaway. Easily accessible from San Francisco, celebrate good life here with superb vines and delicious meals prepared by you with our chefs! Our chefs and cooking classes change daily. Themes range from Mediterranean cooking, Favorite Mexican dishes, essential Thai, Classic Japanese, Tuscan country cuisine, pastry work-shops and easy dinner party classes….Our chefs include John Ash, Rick Bayless, Linda Carucci, Thomas Keller, Diana Kennedy, Jacques Torres, Ming Tsai, Joanne Weir and many more…. Located in the beautiful Sonoma Valley Wine Country four blocks from historic Sonoma Plaza, your home during your stay is a luxurious 64-room hotel and spa set in the midst of wineries, fine dining, shops, and unique galleries. Originally a prestigious 300 hundred-acre vineyard and working ranch with prized trotters, the lush 19th century estate has been transformed into a luxurious inn and spa, receiving rave reviews and awards. Each of the Inn’s rooms and suites are individually appointed with designer furnishings, down comforters and custom linens. The Inn’s 29 suites offer fireplaces, king-sized beds, original art, hydrotherapy tubs or rain showers, wet bars, flat-panel televisions, and DVD players with six-speaker surround sound. The Garden Spa offers over 40 different massage, facial and body treatments utilizing the flowers, herbs and plants found in the garden. Special offers: Enquire about our weekday (Sunday- Thursday) and winter specials! Accommodation in classic or deluxe room in 4* luxury boutique hotel, based on double share, daily buffet breakfast, nightly wine& cheese reception, daily hands-on cooking courses, recipes, tastings, tea, coffee during the class, 50-minute massage per person, tax and service charge. Travel to and from hotel and cooking school, meals and optional excursions not listed. Nearest airports are San Francisco or Oakland and from here it is a 45 min scenic drive to the wine country. We recommend renting a car to explore the beautiful surroundings outside of cooking classes. “I cannot say enough good things about classes and accommodations. The cooking classes are wonderful. The kitchens were splendid. The instructors were professional and fun. The assistants were helpful and gracious to all students. The food was great and the cake was the best I have ever done! What an incredible experience. Highly recommend this school to all. The Inn was warm, comfortable and cozy. The rooms had all the comforts one could ask for. The staff very accommodating. The restaurant was excellent. Loved the spa. Had a facial done by a very professional and sweet young lady named Jill. “The trip was wonderful. My husband had an amazing time (he now refers to himself as a pastry chef after successfully making a tart) and wants to return again next year. “Thank you for your help in planning our wonderful trip! We had a lovely time in Sonoma. The accommodations were excellent- everyone was extremely courteous and we were quite pleased with our room, especially with the fireplace. I would recommend it to anyone who was interested in staying in that area because it is within walking distance to the main square but still far enough away to provide some intimacy from the hustle and bustle. We absolutely loved our classes. They were well-organized and we were able to be directly involved in all of the cooking and then enjoy our spectacular meals with the gracious instructors. We are planning to definitely return for classes on future vacations to California.